Paul, W0AIH, asked me to give him an opinion on what I might use as a replacement for a BN86 balun used on a 20 meter monobander. I knew that Paul and a number of other people in the Minnesota Wireless Association (including me) and some of the other Contest Clubs across the country had participated in a huge (more than 1000 pieces) buy of FT240-30 cores in just the past month. Since we had these inexpensive ($2.50 each) cores it seemed like that might be something to consider. I was aware from some early experiments that windings on these cores would have high resistances as well as fairly high inductive reactance. Paul had asked me to do this because he knew I had an antediluvian piece of equipment that could measure such things -- a General Radio 1606A RF bridge. Not as fancy as the new solid state stuff, but more reliable for me than making those measurements with an MFJ-259B. I don't have an Autek unit so I am not sure if they would or would not work well. I fired up the HP-8640 and generated a signal at 14.000 MHz which I injected into the bridge. I used my HP-141T/HP8553B spectrum analyzer as the detector --- an elephant gun applied to a mosquito I admit. Anyway, I decided to use a short length of RG58 wound through the core to simulate a feed line. I measured the reactance of the shield to get an idea of how much choking of RF common mode current would take place for various numbers of turns through the core. Remember that each time the coax goes through the core it is one turn so that my one-turn entries in the tables below mean that I simply ran the coax in and out of the core; two-turns would be in and out and then back through a second time- It might LOOK like one turn but it actually is two. I decided to do the measurements for both the FT240-30 core and also for an FT240-61 core that I had. I expected that the type 61 material would produce impedances that had much lower resistive components than the type 30 material and that proved to be the case. As a rule we would like to have the choking impedance be ten times larger than the impedance of the feed point. Four turns on the FT240-30 core certainly does that. The same number of turns on the FT240-61 core is only about seven times the typical 50 ohm feed point. That isn't bad and in its favor there is virtually no resistance. That means there will be no power loss in the choke. Of course with a resistance of 840 ohms there probably is not going to be much if any loss in the other choke. The inductive reactances of both chokes are about the same. Originally I measured only up to four turns on the cores. I wanted to add another turn but I knew if I did I would have to get fancy and insert a capacitor in series with the choke. The reason may not be obvious, but if we multiply the reactance for four turns, about 350 ohms, by 14 we get a bridge reading of 4900 and the bridge is only calibrated up to 5000. When we wish to read inductive reactances larger than that we must add a negative (capacitive) reactance in series to bring the total reactance down to something that we can read with the bridge. I did that and got the readings for five turns for the FT240-61. However, when I tried the same thing for the FT240-30 core I found that the resistance was over 1000 ohms and I could not get a null. I gave up on measuring that one so there are no entries in that table for five turns. I decided to see if I could measure the inductance of the 5-turn FT240-30 with my Almost All Digital Equipment LC meter. That turned out to be interesting. I knew the reading would be off because the measurement is done at about 1 KHz. But the five turn type 30 toroid read 59.8 microhenries. I took off turns and found that all of the readings were too high by a lot. I tried measuring the FT240-61 with the AADE meter and this time the readings were quite close to the ones I got with the RF bridge. Apparently the large resistive component affects the readings. I decided I should check the inductances using my MFJ-259B. Neither toroid would give me an inductance reading with five turns. I may have done something wrong because I usually don't try to use that instrument for inductance. I looked at the impedance readings for the two toroids. The type 30 gave an SWR reading of 7.0 and the type 61 read 8.9 SWR for five turns. These values are consistent (approximately) with the impedances I measured with the GenRad RF bridge. [ see the table values above]. My overall feeling is that a four turn FT240-30 would work just fine and a five turn FT240-61 would be about the same if they were used with a beam that had a resistive input on the order of 50 ohms. I would certainly worry less about the type 61 material heating during use, but if the use was outside in open air I don't think I would lose much sleep with either one in place. If anyone has a different opinion about this I would certainly like to hear about it. Also, if someone has another measurement scheme that can give better results that would be interesting too. The picture above shows the three turn setup for the FT240-61 core. You can read the results from the dial (they should be the same as in my table). Remember to divide the Reactance reading by 14 to get the correct value for the reactive ohms. 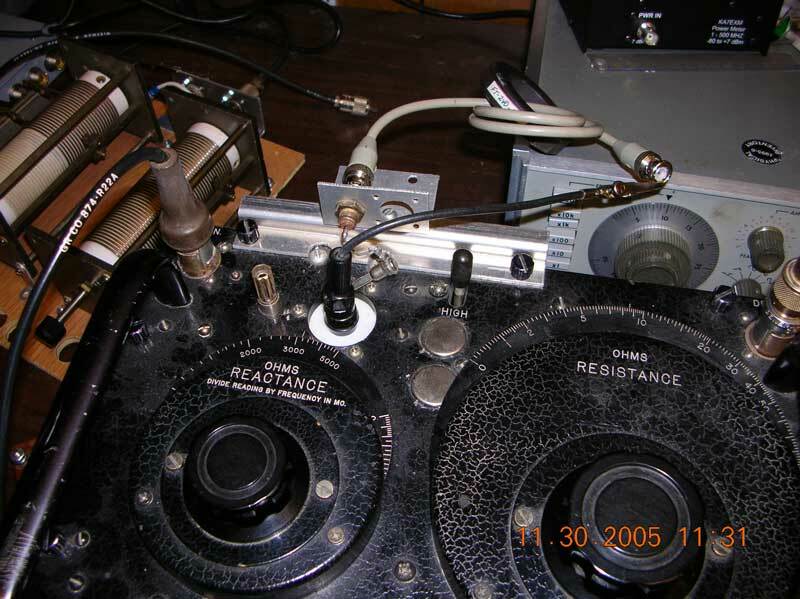 This setup will not provide 1% accuracy but it is certainly within about 5-7% at 14 MHz.